Meet the kea, the world’s only alpine parrot, which also happens to be one of the most intelligent and inquisitive species of bird. Insatiably curious, kea use their hooked beaks to prey open containers (like bottle drinks and trash cans), pull and tear objects (like flags or car antennas), or just move things around (like rolling snowballs across the street). But as the saying goes, curiosity killed the kea. Common activities for the birds include strolling across busy roads to pester motorists for food, picking at old, lead-filled buildings that dot the New Zealand alps and eating poison pellets intended for rodents. 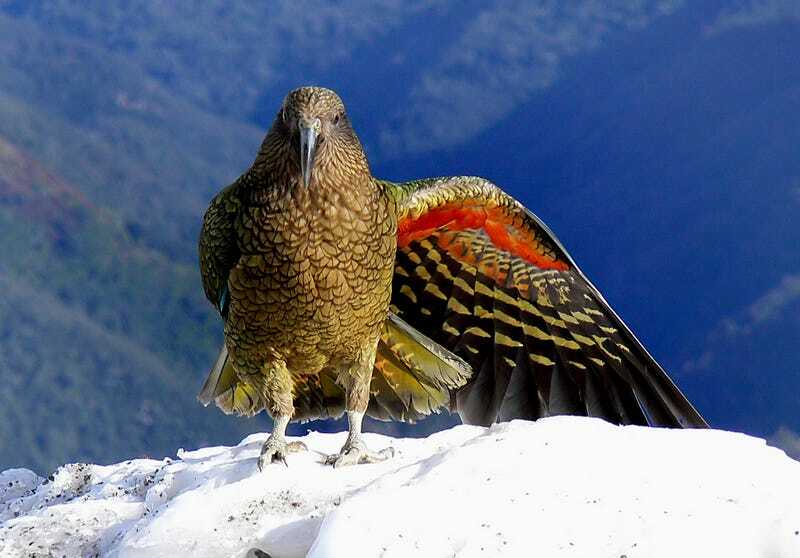 All of this bad behavior, coupled with an uptick in predation from rats, possums and stoats (which pillage keas’ ground-dwelling nests) have led kea populations to plummet to as low as 3,000. But as the birds’ conservation status was raised to endangered (by the wildlife group Birdlife), kea conservation efforts have gone into full gear. And it’s here that we find ourselves with one of the funnier and more remarkable kea stories of them all: the construction of a so-called “gym” which offers the birds objects to distract them, keeping them away from busy roadways. The story starts in November of 2016, when workers for the New Zealand Transport Agency kept finding road cones in the middle of an entrance to a one-way tunnel. The culprits were soon revealed to be a gang of juvenile kea that were shifting the cones into the middle of the street. Why the kea were doing this is up for debate: some wildlife experts have proposed that the cones were being rearranged to stop traffic, so the kea could try to get food from passing tourists. However, given the kea’s mischievous nature, there’s a good chance the cones were being moved for pure entertainment of it. Whatever the reason, the kea were slowing down traffic and putting themselves in danger. But conservationists had a solution; as 2017 came to a close, a strange looking contraption was placed near the entrance of the tunnel. The so-called gym, which looks like a religious shrine from a scrapper-turned-modern-artist, is ripe with spinning, shiny objects, which should distract the kea and keep them off the roads. While this whole cone-gym fiasco seems pretty ridiculous, the story forms part of a larger narrative that’s central to the kea conservation effort: stopping kea from eating human food. This isn’t so much because Doritos and french fries are killing the kea, but more because once kea realize that scraps left by humans are edible it, they’re much more likely to munch on anything that they find lying around. And this is a big problem, because one of the things kea keep eating are poison pellets meant to rid New Zealand of it’s rodent problem. To understand why New Zealand has kea-killing pills laying all over the place, we need to go back a bit, about 80 million years. That’s when New Zealand separated the supercontinent Gondwana, and its been floating around in near isolation ever since. For almost all of this time, the islands were rodent free, and the only land mammals that were found in the region were bats. This lack of predators allowed for some pretty remarkable ecology to flourish, like the moa, a flightless bird that could grow to 12 feet in height, or the iconic kiwi and the giant kakapo parrot. But then, in the 13th century, the Māori came to the islands, and with them came rats, mice, stoats, weasels, and possums. After almost 80 million years with no predators, the unique species on the islands just weren’t prepared to run, hide and survive. The results have been catastrophic: already about 25% of New Zealand’s endemic birds are gone, and it’s estimated that mammalian predators kill 25 million native New Zealand birds a year, including the wily kea. So, in order to try to rewind the clock and give New Zealand’s birds a chance of carrying onto the 21st century, the New Zealand government announced a to rid the islands of all rats, stoats and possums by 2050. In theory this should be good news for the kea, as predation by rodents is one of the driving factors in their decline. But in practice, the government is trying to eradicate rodents by air-dropping poison pellets all over the country. And kea that have become used to human food see these pellets as another tasty snack. The gym near the tunnel isn’t the the only conservation tool that’s being used to save the kea, but it is one of the more entertaining ones. Let’s hope that kea populations can bounce back, so these mischievous birds can keep causing trouble in the years to come. And for that, let’s hope that the kea stick with their New Year’s resolution and keep going to the gym.